July 15th Singapore - Visitors to the 2010 Singapore Garden Festival on show at the Singapore Suntec Convention Center will get to see five-metre tall giant display. 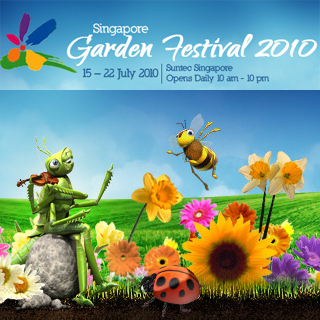 Following two successful editions in 2006 and 2008, the Singapore Garden Festival (SGF) returns to Suntec Singapore International Convention & Exhibition Centre today till 22 July 2010. The Festival is the only one in the world to bring together top award-winning garden and floral designers from around the world, under one roof. Taking centerstage during the eight-day Festival will be the giant centerpiece inspired by the French eco-fable, The Man Who Planted Trees, written by award-winning French author Jean Giono in 1953. This charming fictional tale has inspired generations of environmentalists as well as reforestation efforts worldwide. Festivals as well as Dr Claire Whitehouse who has designed and staged 15 medalwinning Show Gardens at the Chelsea Flower Show. Seedlings planted today will grow over the next three months and shape the look of The Man Who Planted Trees.